“Imagine the worst situation — we lose Fabregas and Nasri. You cannot convince people you are ambitious after that. It seems a long time ago now, but when Samir Nasri arrived at the club, it was as a replacement for the outgoing Aleksandr Hleb. After a largely indifferent few years, Hleb had one impressive campaign as a key component of Arsenal’s title charge in 2007/08. It would be his final season, as Hleb moved on at the first opportunity, joining Barcelona after threatening to invoke the ‘Webster’ ruling and buy out his contract. Nasri’s departure certainly evokes memories of Hleb’s exit. Last season was comfortably the Frenchman’s best, and seems to have left him with both an inflated ego and idea of what he ought to be paid. After turning down a £90,000 p/week contract extension, Nasri left Arsenal with a clear choice: sell him now, or risk losing him for free in twelve months time. For me, it’s a no-brainer. As Arsene pointed out, both “economically and psychologically”, the club only had one option. And, for economic and psychological reasons, Arsenal will be quietly delighted to have sold the player to City rather than United: his original suitors. It’s worth noting that whilst Hleb left for the mediterranean sun and footballing Mecca of Barcelona, Nasri is moving to Manchester. Whilst I’m sure he has doubts about Arsenal’s ambition, it’s clear that money has been the major motivating factor. Hleb’s career has tumbled downhill since leaving: he has found himself unable to replicate his success at Arsenal elsewhere. He’s an unusual, idiosyncratic footballer, who needs a manager with the patience to indulge a player who, whilst technically brilliant, is prone to overelaboration and seems to be allergic to shooting. Samir Nasri will have no such problems adapting. He’s a more effective but more straightforward footballer: quick, skilful, and a smart finisher. However, by the same token, he is also easier to replace. Whilst hugely talented, he lacks the intangible quality of ‘vision’ that marked out Cesc Fabregas, say, or even Hleb. As a goalscoring wide-attacker, the likes of Gervinho and Walcott are well-placed to try and fill the gap left by Nasri’s departure. The bigger problem remains the creative void created by Fabregas’ move. Arsene’s plan, of course, was to use Nasri in that role. As outlined above, I’m not sure he would’ve been the right man for the job. Cesc was good for twenty assists per season. I don’t have the stats in front of me, but I believe last season Nasri got one. Nasri can walk through an open door with plenty of style; Arsenal need someone who can unpick a lock. Arsene may live to regret the statement of the top of this piece – but he doesn’t have to. If he spends the £50m or so he’s received for Nasri and Cesc on players of similar quality, then all is recoverable. I have known for some time that I’d have to write this post. Probably ever since Cesc Fabregas arrived as a 15 year-old back in 2003. I ought to have prepared it and kept it on file, ready to go, like major media organisations do with obituaries. And yet, for some reason, even as the past week has made it clear his departure was imminent, I haven’t dared to start it. Patently, it’s because I didn’t really want to. The deal was done on Friday morning, though we’ve waiting till now to make any kind of official announcement – hopefully we’ve used the intervening period to make advances in spending the money we’ll receive for Cesc. On that note, there’ll be more from me on what Arsenal need to do to replace him later today, so stay tuned. The fee has been confirmed by Sandro Rossell as being €29m upfront with a possible further €10m in add-ons. That’s an absolute maximum of £34.2m. It is, of course, a steal. At the start of the summer we would have laughed off such a ridiculous fee. Now, it’s Barcelona who are laughing. Their disruptive tactics have won the day, and ultimately the player’s desire to move has seen us do a deal at a fee lower than that for which for Andy Carroll moved to Liverpool. Aside from Barca’s antics, our negotiating position was weakened primarily by the fact that the race to sign Cesc contained just one Catalan horse. On the open market, he’d fetch £50m+, no doubt. To be honest I don’t think the fee really matters. It’s almost entirely profit, meaning it even surpasses the ludicrous amount we made on Nicolas Anelka when we flogged him to Real Madrid. Whether he went for £30m, £40m, or £50m really makes no difference to me: he’s going. Cesc is already in Barcelona and will undergo a medical tomorrow morning before being presented around 1230 UK-time. I will, at that precise point, be undergoing an operation in a dentist’s chair. Which promises to be less painful than having to watch him paraded. There are so many reasons that losing Fabregas is a blow. He’s the club captain, and the heartbeat of the side. He is one of the world’s finest midfielders. And, for so long, he felt like one of our own. Collectively, we watched him grow and develop from spindly prodigy to midfield maestro. I was there at Highbury when he became our youngest ever player against Rotherham in the League Cup. I was there when he became our youngest goalscorer, tapping in against Wolves. And I was there when he came of age in 2006, winning a duel with the grand master himself, Patrick Vieira, who by that time was playing for Juventus. In his early years, Cesc lived with a club landlady, whose son is a friend of mine. To them – indeed, to all Arsenal supporters – he always felt like family. Inevitably, therefore, his departure feels like a rejection. Forgive the crowbarred analogy, but it’s a little like an adopted child deciding they’d like to go and be with their real parents. As much as we understand, it still hurts. Whilst the pull of home is clearly a factor, one can’t help but feel a tinge of regret that Cesc is leaving earlier than any of us expected. Xavi is a long way from calling it a day, whilst the likes of Aaron Ramsey are not yet ready to fill the vacuum created by his absence. He’s left, ultimately, because he no longer believes in the project. He wouldn’t relinquish the armband lightly. If he felt he could win trophies as captain of Arsenal, he would be staying for a year or two at least. 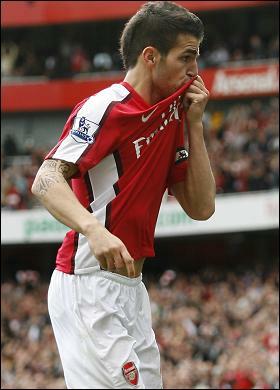 Whatever anyone else tells you, whatever you read elsewhere, do not doubt that Cesc Fabregas loves Arsenal Football Club. Barcelona is in his blood, but Arsenal is in his heart. Sadly – and this will hurt Arsene enormously – he no longer believes that the team built around him with bear the fruit of trophies. I can understand his frustration. His star has too often shone alone in Arsenal’s galaxy. The failure to sign the established players his talent deserved around him has cost him and Arsenal dear. Now, at Barcelona, his potential seems destined to finally be fulfilled. When I hear pundits claim Cesc will warm the bench at Barca, I chuckle. Alongside the likes of Xavi, Villa and Messi, he will step up another gear. It pains me to say it, but I think Barca will see the best of Cesc. Whatever they ended up paying, it would have been a bargain: Fabregas is a Ballon D’Or winner waiting to happen. He does, however, leave us with an awful lot of memories, including 303 appearances, 57 goals, and 98 assists. It’s sad that it ended the way it did, but when he was on the pitch for us I never doubted his commitment. I won’t be talking too much about Fabregas from now on – it’s important that the whole club moves on. Nor will the departing Samir Nasri be afforded a similar eulogy. But for now, for the sake of nostalgia, let’s end with some of Cesc’s finest moments. The following video ends with an optimistic “to be continued?”. Sadly, it seems this love affair is, for now, over. It’s less “Cesc We Can”, and more “Cesc we could’ve”. Well, we were promised transfer activity this week, and now we’ve got it. 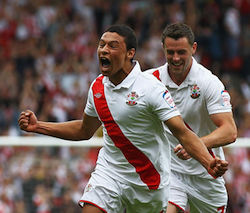 Southampton’s 17-year-old winger Alex (Oxlade) Chamberlain has signed for Arsenal, for an undisclosed fee. Depending on who you believe, Southampton stand to receive either ten, twelve or fifteen million pounds for the player, depending on performance-related clauses. One things for sure – it exceeds the £9m we ended up paying for Theo Walcott, with the Saints themselves saying their previous transfer records have been “blown out of the water”. Arsene initially pushed for a deal to be done in January, but Southampton’s desire to ensure promotion to the Championship saw them resist any bid. Ideally they would have liked to keep Chamberlain this season too, but the player made life harder by declaring his desire to move. Now it seems Arsenal have come up with the requisite fee to make all parties happy. He’s clearly a player of real potential, and as such is a welcome addition to the squad. However, it’s a signing that’s taken me a little by surprise, despite Arsenal’s long-term interest in the player. When you look at our squad, we’re not lacking in wide attackers: Nasri, Arshavin, Gervinho, Walcott, Rosicky, Miyaichi and Vela can all occupy those positions. With a fee of this size, it’s hard to see us loaning Chamberlain out, so perhaps the rumours that Carlos Vela and Miyaichi may be set for temporary moves abroad have some truth to them. There will doubtless be fans who are frustrated at Arsene’s willingness to pay such a high price for a teenager when he baulks at similar fees for established internationals. I share that frustration. All I can say to that is that I hope Chamberlain is the first of several new faces, the rest of which will be slightly more experienced than the young Englishman. Of our three summer signings thus far, two have only ever played in League One. Intriguingly, the other, Gervinho, has played in the similar-sounding but significantly more competitive Ligue 1. I can’t be alone in hoping we still get that Premier League-hardened defender we badly lack. For now, however, we welcome Alex Chamberlain aboard the good ship Arsenal. An ankle injury has held up his pre-season, so I don’t expect him to be in contention for a few weeks yet. Having followed the same path, the press will doubtless be hailing him tomorrow as ‘The New Theo Walcott’. If, however, you want a more considered view of the player, you can read this piece – Ready Or Not: Alex Chamberlain, from January. Or, indeed, have a gander at the video below. More tomorrow.